Heavy scent. 4+ Feet. July flowering. Just as Bogart and Hepburn toughed out the heat of Africa, this exquisite lily, true to its name, will tough out hot conditions and adversity as well. Its apricot-melon to apricot-cream shades remain extremely colorfast and sturdy even in searing heat. Reverse color varies from light to deep bronze on most flowers of this seed grown strain. Bred from the finest selections of the 'Copper King' Strain. 5 to 6 feet. July Flowering. Highly Fragrant. 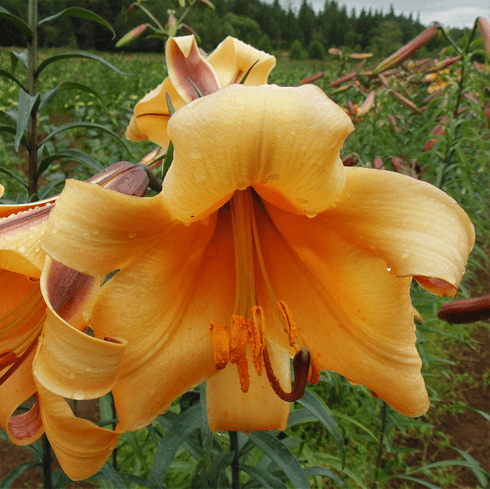 Bulb Size - Our standard for bulbs of this Trumpet Hybrid Lily Bulb cultivar ranges from 16/18 cm to Exhibition-size (over 20 cm).